Dimensions: 350mm Width ¦ 252 Depth ¦ 112 Height (Closed) ¦ 320 Height (Open). This product is covered by a 2 year manufacturer's warranty as standard. Includes spindle size adapter and 5V power adapter. 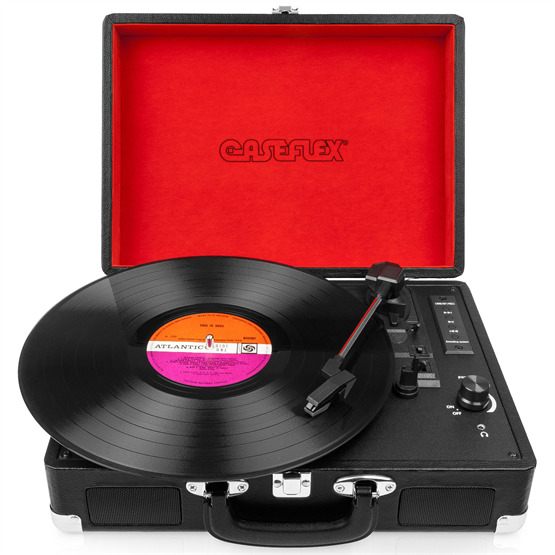 Take a trip down memory lane and enjoy your favourite vinyl records with this fantastic record turntable and stereo system from Caseflex; proud suppliers of the best gadgets, electronics and accessories. Designed in the shape of a briefcase to allow for easy storage and portability; this Caseflex vinyl player sports a professional looking black exterior with silver trimmings and a stylish red felt interior ensuring it looks great no matter where you are. This Caseflex record player features a full set of comprehensive playback and audio controls including volume, play / pause, next / previous track, audio mode, record mode, turntable speed and auto-off. In addition to playing vinyl records, the player is capable of playing audio directly from any USB device, SD card or Bluetooth enabled device at the touch of a button and the dual stereo speakers provide a fantastic listening experience. Perhaps the most useful feature of this Caseflex record player is the ability to record the audio from your vinyl records and save it as an MP3 file; ensuring you always have access to your favourite albums when you don't have access to a record player or if the records are damaged or lost.